Texas County Missouri Genealogy, History, maps with Houston, Cabool, Licking, MO, Civil War, Goodspeed, Goodspeed's, Goodspeeds, biographies, biography, family, families"
An informative and historical overview of Texas County, Missouri including three separate sections on one CD which include 4 historical maps (1851, 1913, 1920's and 1929), plus the full Texas County section from the book: Goodspeed's History of Texas County, Missouri originally published in 1889. An important resource for the study and research of Texas County, Missouri history and genealogy. A. A rare 1851 map that shows Texas County when Texas County was only six years old. B. A map of 1913 Texas County showing the locations of 55 different settlements including all of the following: Alice * Arroll * Bado * Bigcreek * Bucyrus * Cabool * Clara * Clearsprings * Coulstone * David * Dent * Dykes * Edanville * Elkcreek * Ellis Prairie * Embree * Eunice * Eveningshade * Fowler * Gravelpoint * Grogan * Hartshorn * Hattie * Hazleton * Houston * Huggins * Hurst * Kimble * Ladd * Licking * Lundy * Maples * Mahan * Nagle * Nile * Oscar * Plato * Pleasantridge * Plum Valley * Prescott * Raymondville * Roby * Roubidoux * Samoa * Sargent * Sherrill * Simmons * Solo * Stultz * Success * Summersville * Turley * Tyrone * Venable * Yukon. Included here six pages concerning Texas County from the 1913 edition of The Missouri Red Book and contains about every imaginable statistic you could want for this time period. Some of the facts contained are the number of farms and their acreages, number of cows, horses, mules, pigs, sheep, goats, poultry, colonies of bees, how many farms had mortgages and how many were free of debt, the amount of butter produced, the number of bushels of apples, peaches, pears, etc. harvested, the number of quarts of blackberries harvested, the number of schools and teachers, plus hundreds of other detailed statistics. A wealth of information! Section Three of three, ALL on one CD: The complete 1889 Goodspeed's History of Texas County, Missouri. This detailed (142 pages in all) book has an incredible amount of historical and genealogical information about Texas County from its earliest settlement up to 1889. This is an exact photo replica of all the pages pertaining to Texas County, Missouri including all of the historical and biographical information. Military Affairs (Civil War history) including movements of Union and Confederate forces and including battles and skirmishes in Texas County, Missouri. Includes a lengthy list of soldiers and an indication of Union or Confederate. History of Texas County Cities and Towns including: Houston, Cabool, Licking, Plato, Summerville, Big Creek, Elk Creek, Ellis Prairie, Dykes, Sargent, Raymondville, Pleasant Ridge, Success (or Hastings), Clyde, and Montreal. The cost for this CD containing all three sections described above is only $9.95 plus shipping, or only $4.95 as a digital download! A large amount of history and genealogy information for very little cost! A truly fascinating view of Texas County, Missouri from its first settlement to 1889. 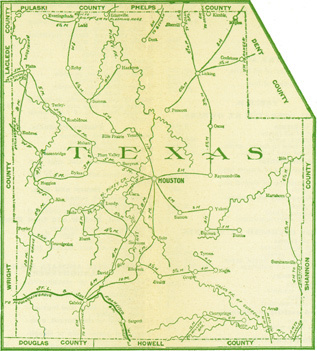 Since we offer many different county history and genealogy CDs, please be sure to specify that you wish to order the Texas County, Missouri History, Genealogy and Maps CD. If ordering more than one CD, the shipping cost is $1.95 for the first CD plus only 25 cents shipping for each additional CD purchased.